September is Blood Cancer Awareness Month, and on Sept. 28, participants will gather at PEAK Sports Club, 4401 Peak Dr., Loves Park, for The Leukemia & Lymphoma Society’s (LLS) annual Light the Night Walk. For more than a decade, area residents have supported the fundraising event, which uplifts those affected by blood cancers. The local walk, averaging about 350 participants, moved from downtown Rockford to PEAK two years ago. Festivities, which begin at 5 p.m., include a DJ, a bouncy house and free food, along with informational booths from various community and support organizations. Once dusk falls – around 7 p.m. – each walker is given a lighted balloon in one of three colors: white for patients, red for caregivers/family/friends, and gold in memory of someone who’s passed from a blood cancer. LLS was started in 1949 as a fundraising and educational organization, by a wealthy New York couple frustrated at the lack of information on leukemia, which five years earlier had claimed their 16-year-old son. The organization grew steadily, first as The Leukemia Society, and later as The Leukemia & Lymphoma Society, in order to reflect its focus on all blood cancers. A major difference between blood and other types of cancers is the mystery surrounding the causes. Even so, research funded in part by LLS ($70 million last year, almost $1 billion in its history) has helped the more than 1 million people in the U.S. living with, or in remission from, blood cancer. In 1964, patients diagnosed with acute lymphoblastic lymphoma had a survival rate of 3 percent; today, it’s 90 percent. Yet research is only one of the programs supported by LLS funds. “In 2012, we provided financial aid to 1,000 blood cancer patients in northwest Indiana and Illinois, and nationwide, the LLS national co-pay program provided $44 million,” Crouch says. Through LLS’s BYOA (Be Your Own Advocate) program, newly diagnosed blood cancer patients are given a free BYOA guidebook to help them through the cancer process, with sections about insurance and financial assistance, on questions to ask, and for recording medical information and storing paperwork. LLS also facilitates on-site cancer support groups, which are divided by cancer type and facilitated by social workers or nurses; its Back to School Program brings together teachers, administrators and parents to develop protocol for a patient’s return to the classroom. Another is the First Connection Program. “New blood cancer patients who have questions unanswered by doctors are put in touch with First Connectors,” Crouch says. “These are trained volunteers and survivors, and they talk to those being affected by the same type of cancer. 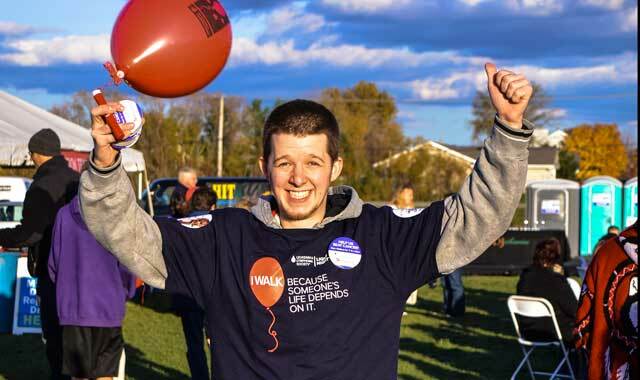 For information on forming a local team, volunteering or finding other Light the Night walks, go to lightthenight.org/il. This entry was posted on Friday, September 6th, 2013 at 12:00 pm	and is filed under Mind & Spirit, Top Posts. You can follow any responses to this entry through the RSS 2.0 feed. Both comments and pings are currently closed.